I'm loving the world of blogging for a whole host of reasons. One of which being, that thanks to "the power of the blog", I have been, very gratefully, introduced to a whole host of fab new products and brands I would otherwise never have discovered. My lotion, potion, and beautification shelf has never looked so well stocked, healthy and plentiful in it's life. 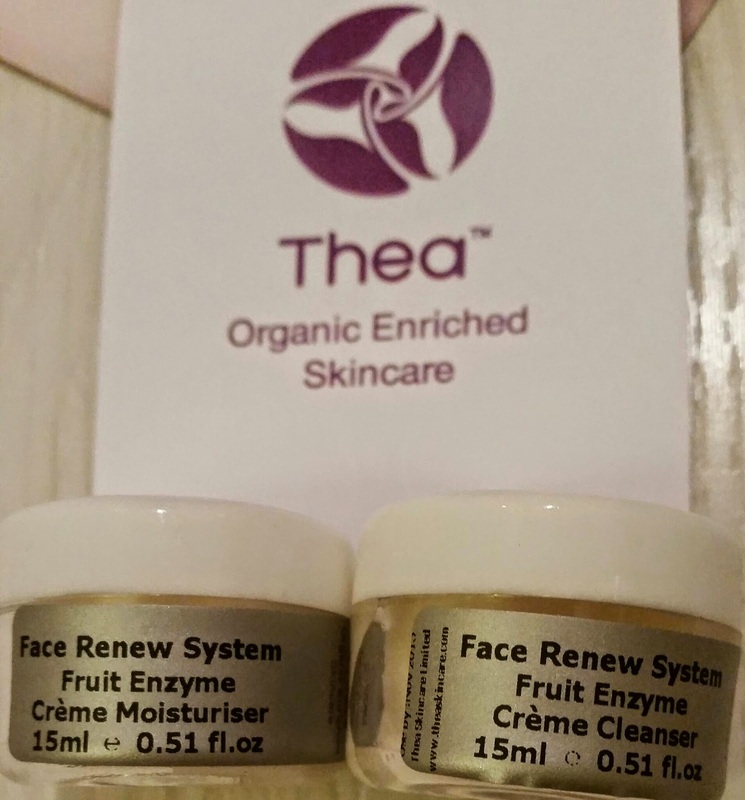 And recently, I have been trying out some little facial sample pots I was sent by Thea Skincare. Thea are a brand which represent pure, luxurious, natural beauty and they offer a whole host of products. The particular samples I was kindly sent were part of Thea's fruit enzyme range - products containing organic fruit acids to help hydrate the skin. From the minute I opened these two little pots I knew I was going to love them. They have got to be the nicest smelling face products I've used in a very long time - if not ever. Maybe it's slightly obvious...with the clue being right there in the name and all...but these smelt so amazingly fruity. The creme cleanser smoothed across my face really easily. It didn't foam up at all on the skin, but with it being a cream product, I suppose that was to be expected. However, this didn't take away from it's face-cleaning-goodness at all. It very gently removed all leftover traces of make-up and daily grime from my face and left it feeling clean and very fresh. And the scent - wow it was just amazing. A really strong, fruity cocktail of loveliness. Which leads very nicely onto the moisturiser which was also tempting to the taste buds - for a different reason. When I opened this I was very much expecting the same scent as I got from the cleanser - but oh no. This scent was a lot subtler and for a while I couldn't pinpoint exactly what the difference was...but then it hit me - it whisked me back, in one swift moment, straight to my teen years because I definitely caught a strong whiff of an alcopop escaping from the little pot. Yep - you heard right - it smelt of an alcopop. It's moisturising capabilities were brilliant too - even my Hubby can't keep his hands away from it. It melts into the skin perfectly, making it smooth, fresh and touchably soft.